In the past four years, the total pay for chancellors and presidents of Texas universities and systems has grown 70 percent, from an average total compensation of $565,000 in 2012 to an average of $955,000 now. With tuition costs growing, Texas university presidents and chancellors have strived to make clear that they’re working hard to keep expenses down. But there’s at least one area where spending has spiked in recent years: The salaries of chancellors and presidents. In the past four years, total pay has grown 70 percent for the leaders of Texas’ six university systems and presidents of those systems’ namesake schools — the University of Texas at Austin, Texas A&M, Texas Tech, the University of North Texas, the University of Houston and Texas State University. In 2012, their average compensation was $565,000. In 2016, it’s $955,000, according to data from the Legislative Budget Board. The growth comes from increased salaries, plus plentiful retention bonuses, benefits and incentive payments. And when all that compensation is accounted for, there are now four top-level public university administrators making more than $1 million per year. (That doesn’t count athletics coaches, administrators overseeing medical schools or endowment investors.) In 2012, no presidents or chancellors were making seven figures. The people earning that money are being paid to govern universities and systems with multi-billion dollar budgets. Their pay hardly registers as a blip in tuition bills or in their universities' total expenses. But the pay could turn out to be a headache for officials in the coming months as they argue against efforts in the Texas Legislature to rein in tuition costs. Some lawmakers have already begun to take notice. The growth is uneven, but each of the six university systems is paying its chancellors and flagship university presidents significantly more than in 2012. In some cases, turnover can at least partially explain the growth. In others, the administrators simply received big raises. Bill McRaven became chancellor of the UT System in 2015 and earns a $1.2 million salary. The system reported his total compensation to the state as $1.9 million for the 2016 fiscal year, an amount that included $400,000 worth of deferred compensation that is subject to a vesting period. His predecessor, Francisco Cigarroa, had a $750,000 salary in his final full year in office, according to reports the university system submitted to the state’s Legislative Budget Board. 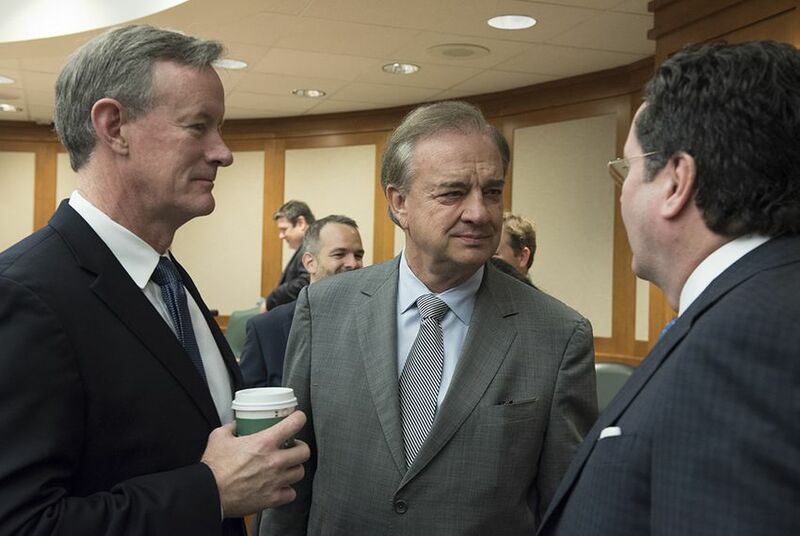 "We believe Chancellor McRaven is worth the investment and that the people of Texas will benefit from his time at the UT System for generations to come," said Paul Foster, chairman of the UT System board. A similar pay boost accompanied Texas A&M's hire of new president Michael Young. His base salary is $1 million per year, and last year he received more than $800,000 worth of bonuses and other compensation. His predecessor, Bowen Loftin, earned a $425,000 salary. A&M System Chancellor John Sharp received a raise from $507,000 per year to $900,000 per year in 2015. His total compensation, including non-salary benefits, was reported as $1.1 million. University boards of regents are in charge of setting and approving the pay rates. Members, who are appointed by the governor, said the increases reflect the competitive market for university administrators. Not many people are qualified for a job that includes overseeing thousands of employees and billions of dollars' worth of expenditures. Competition is fierce for the people who are, regents said. Tilman Fertitta, chairman of the UH System Board of Regents, said his board has reviewed salaries across the country and decided that Khator’s pay is justified. “She achieved many of the ambitious goals she set for UH and the UH System in a remarkably short amount of time, and we look forward to even greater success for UH and the UH System under her leadership,” he said. Longtime A&M System Regent Phil Adams said Sharp and Young have helped keep costs down and, through their leadership, have generated hundreds of millions of dollars in revenue. The state's top private schools also pay their administrators substantially. The presidents of TCU, SMU and Rice University all make more than $1.3 million per year. Baylor University President Ken Starr made about $933,000 in 2014, according to university tax filings. The competitive market for quality hires is a common explanation for the high pay, Stripling said. But other states have tried to cap the growth in administrator salaries. So far, it hasn’t seemed to have a major impact on hiring, he said. “You won’t hear people today say that we can only hire bad people because we put a cap on this,” Stripling said. No public effort to cap pay in Texas has emerged. But frustration appears to be rising. On Tuesday, Lt. Gov. Dan Patrick decried large bonuses and salaries for top employees, suggesting it was a sign universites aren’t being as stingy with their money has they have suggested. At least one university president appeared to foresee that argument. When Greg Fenves was hired as president of UT-Austin in 2015, regents offered him a $1 million annual salary. He turned it down, a decision first reported last year by the Austin American-Statesman. His base pay is now $750,000, which is about $125,000 more than his predecessor. “With many issues and concerns about administrative costs, affordability and tuition, such a [million-dollar] salary will affect the ability of the president to work with the Texas Legislature on matters important to the university,” Fenves wrote Pedro Reyes, the UT System’s executive vice chancellor for academic affairs, according to the Statesman. Disclosure: The University of Texas System, the University of Texas at Austin, the Texas A&M System, Texas A&M University, the University of Houston, Texas Tech University, the University of North Texas, the Texas State System, Southern Methodist University and Rice University have been financial sponsors of The Texas Tribune. A complete list of Tribune donors and sponsors can be viewed here.